You may wonder why Impressionism didn’t occur before the late 1800s when greats like Manet, Monet, Renoir and Sisley met and shared ideas in Paris’ Cafe Gerbois, and later in Cafe de la Nouvelle Athenee. When you examine the history of painting, you will find that hints and forerunners of Impressionist style were emerging all through the 18th and 19th centuries, but it wasn't until late in the 19th century that the groundbreaking Impressionism movement hit the ground running. The development of new paint pigments and the technological miracle of photography also contributed to the evolution of this incredible movement. Landscapes as a subject for paintings have gone in and out of artistic fashion over the centuries. You can find landscapes depicted in fresco and mosaics that date all the way back to 600 B.C.E. It’s likely that humans have been trying to recreate the beauty of the world around them since the first paintings found on cave walls in Indonesia. The artists that are thought to have inspired the Impressionist movement are no exception. They worked to depict the beauty of their local landscapes in France and England. While Impressionism began in the 1860s, it was inspired by much older - and occasionally less celebrated - painters. All the way back in the early 1700s, Jean Antoine Watteau began focusing on displaying natural light in his landscape paintings. 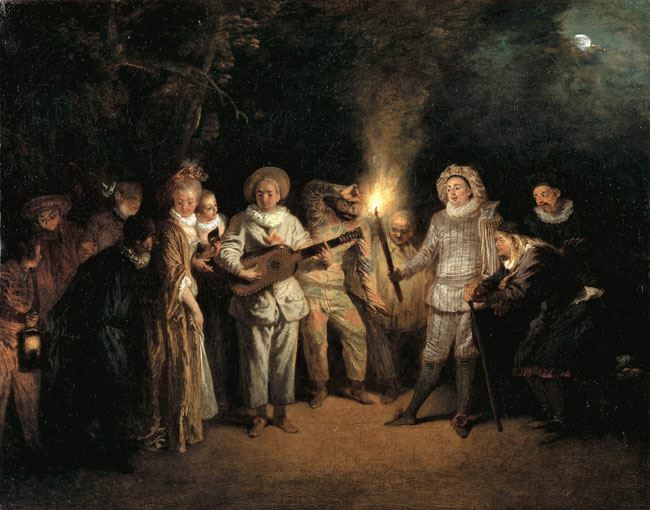 A man before his time, Watteau developed the style called Les Fetes Galantes, which means The Chivalrous Holidays. This style most often depicts men and women in elegant dress enjoying the outdoors. Many of the painters contemporary to Watteau were financed by the Church or by the government. However, Watteau chose to sell his work directly to regular people and was thereby able to experiment artistically. 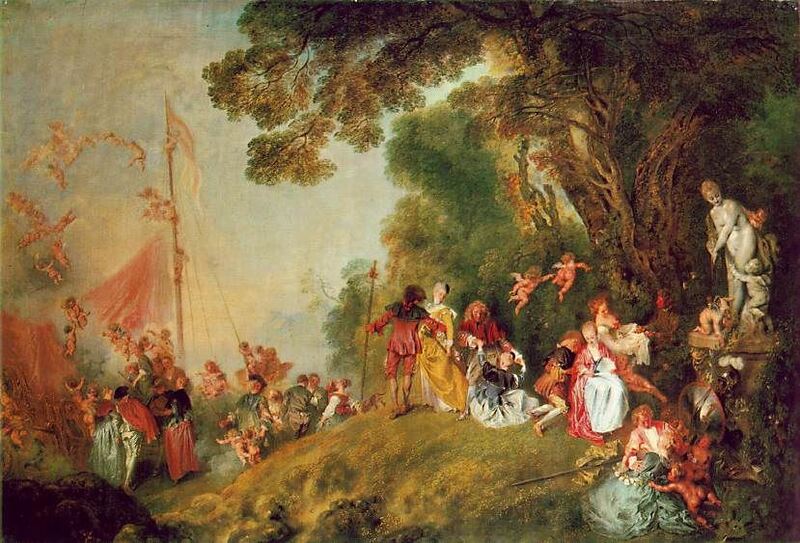 The reason that Watteau influenced later impressionist painters is not necessarily his subject matter, though many of his paintings depict outdoor scenes. It is his play on light and shadow. Natural light influences the entire tone of each composition. You can see this clearly in the two Watteau paintings below. These two contemporaries focused on capturing the natural play of light in their landscape paintings. Constable additionally used a stylistic notion that would later become part of the Impressionist style - the application of unmixed color directly onto the canvas. 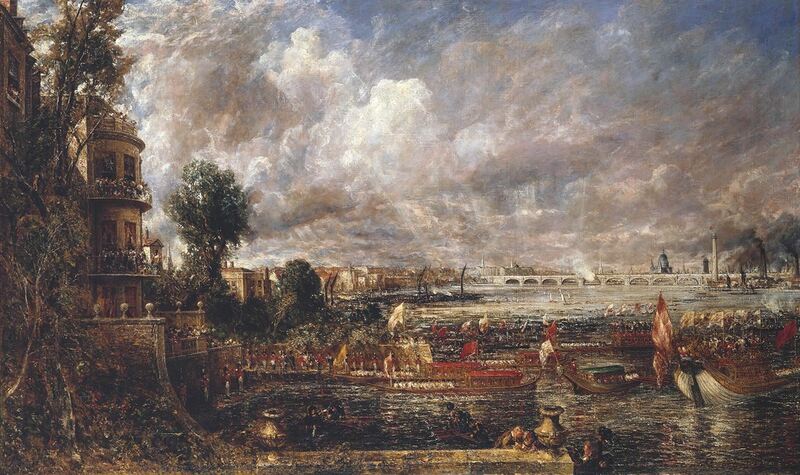 Critics of Constable accuse him of painting his The Opening of Waterloo Bridge with a palette knife. This piece was painted well before the Impressionist movement - back in 1817. 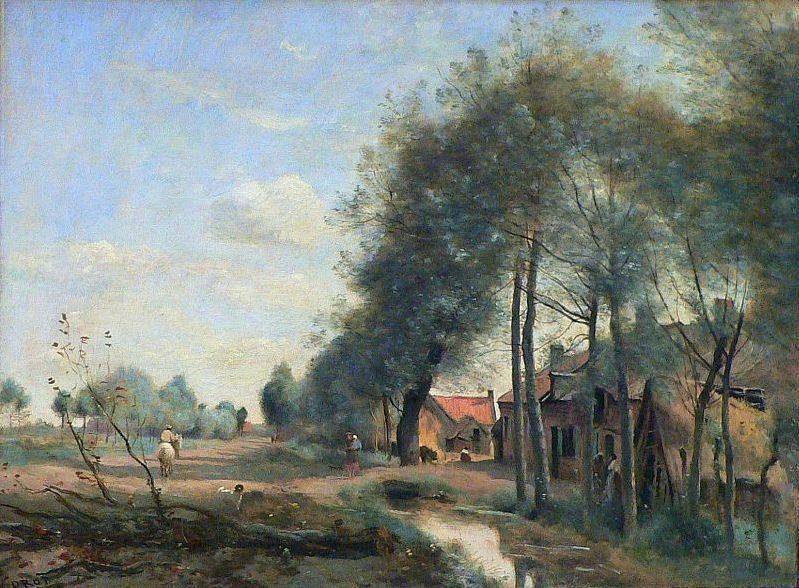 Breaking into the French art world in 1826, Corot painted en plein air before it was fashionable. Additionally, he chose to paint subjects in their natural locations - whether it be a city street or a forest. When he worked outdoors, Corot would create spontaneous sketches capturing the light and color of nature. However, the French art world was not ready for Impressionist stylings, so he would only publically exhibit larger paintings that he created in his studio. If you’ve been following along here, you may have noticed that we are almost up to 1867, when Impressionism was offically developed. However, there was one additional significant change the art world before Monet, Renoir and Sisley met up in Cafe Gerbois and began a movement that would alter the face of modern art, which was the development of photography. Impressionism is most significantly a study of light and color, capturing the ephemeral nature of light itself. The term “photography” is derived from the Greek “photos” meaning “light” and “graphe” meaning “drawing.” The term literally means “drawing with light.” Because photography was invented in the early 1800’s in England, and later developed more fully in France, Brazil, and England, it becomes obvious that the play of light and shadow was ingrained in the zeitgeist of the time. Not only were inventors fascinated with capturing light - so were artists. This is a fascination that continues into the modern day. As a final note on the history of Impressionism - the list of artists above are by no means the only influencers of Impressionist painters. Other artists like Diego Valazquez, Francisco de Goya, Gustave Courbet, and even the vibrancy of Japanese prints made an impact on the minds and souls of the originators of Impressionism. While Impressionism is an iconic style of painting today, it was not always recognized as such. While critics like Edmond Duranty praised impressionist works, other art critics lambasted painters using this style. 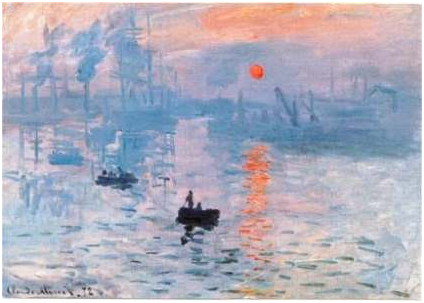 One such critic, Louis Leroy, accidentally named the art movement while trying to insult Claude Monet’s Impression, Sunrise during an exhibit in 1874. Leroy accused the piece of being a sketch or “impression,” i.e. not a finished painting. Though Leroy was attempting to poke fun at the loose brushwork that is now characteristic of Impressionism, he accidently gave the movement its name. Impressionism is now a celebrated style and has been recognized as the birth of modern art. Many 20th and 21st century artists have been deeply influenced by the artists that formed the Impressionist movement, along with those who came before and after this movement. We will talk about the development of Impressionism and Post-Impressionism as well as the style’s influence on later painters in our next two articles. If you haven’t already, we hope you will take a moment to look at the Erin Hanson Gallery, which exhibits Hanson’s unique Open Impressionist style. Take this opportunity to examine and compare Hanson’s art to the masters of the past. We think you’ll understand why we have decided to take this in-depth look at Impressionism once you have considered her artwork.